Antique Hybrid English Staunton Chessmen. Offered here is a set of Antique Hybrid English Staunton Chessmen. The King stands 3-3/8″ tall with a 1-1/2″ diameter base. 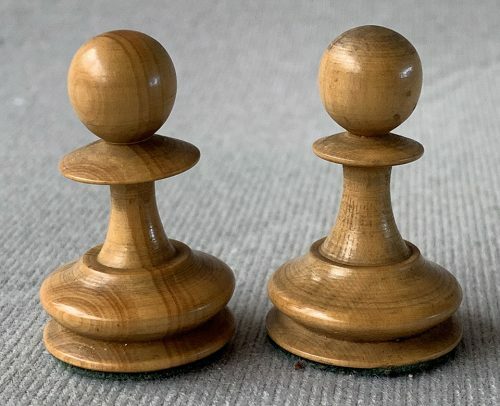 The Boxwood and Ebony chessmen are lightly weighted and sit atop green baize base pads. The profile of the pieces would indicate that the chessmen were produced around 1875. This set of Chessmen was assembled from chess pieces of the same design, but from two different cuttings. They were made by the same manufacturer, but at different times. There are two shades of green baize base pads. The pieces of similar rank are slightly different in height and base diameter. The Pawns have two slightly different profiles. Aside from the chip at the base of the Ebony King and the replacement Kings’ finials, the chess pieces are undamaged. 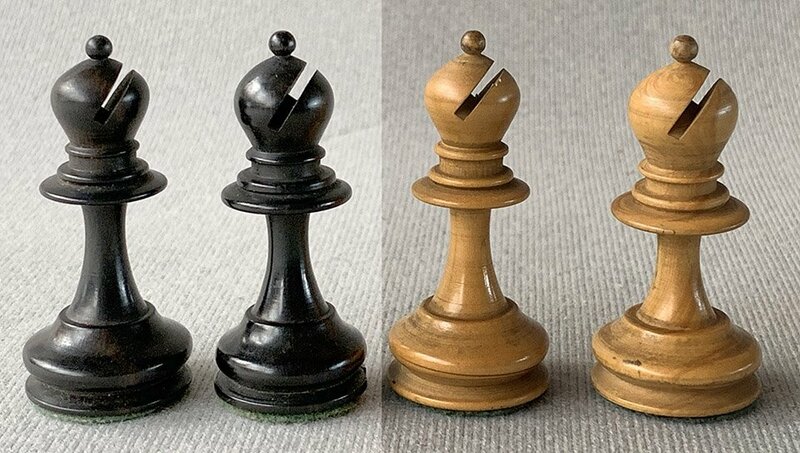 It also appears that the lower base of one Ebony Bishop and one Ebony Rook has been turned down to remove minor chips. However, when sitting on a chessboard, the differences are very light and not noticeable. 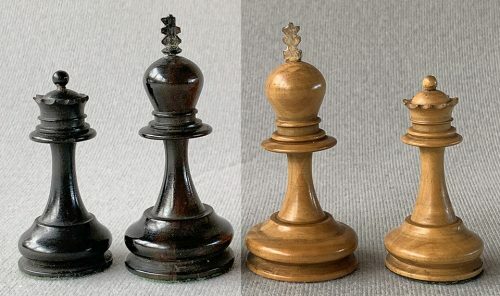 Other than the obvious mismatches and damage to the Ebony King’s base, the chess pieces are generally in very good condition. 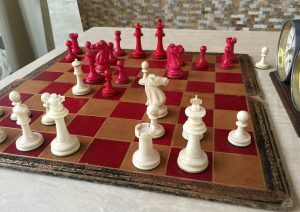 The Antique Hybrid English Staunton Chessmen display and play best on a chessboard with 2″ or 2-1/4″ squares. A suitable antique or modern chessboard can be found elsewhere on this site.